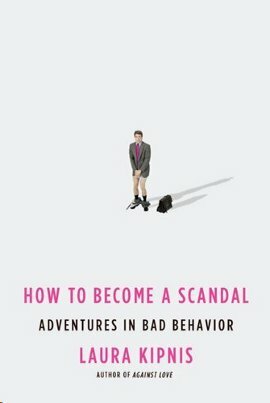 Laura Kipnis, author of the polemics Against Love and The Female Thing, takes on another kind of social performance in How to Become a Scandal: Adventures in Bad Behavior . As with her earlier books, Kipnis takes a common set of behaviours and their attending rationales, and teases them apart to uncover the individual and collective purpose and implied meaning. Kipnis is looking to “develop a theory of scandal” – to understand its structure and function. Kipnis examines four familiar and widely reported scandals of recent years, with supporting shorter and smaller-scale examples, looking at both the performer of the scandal and the audience provided by their community and society. In the first section, ‘Downfalls’, she asks what happens to the individual psychologically that leads them to behave in such deranged way while still maintaining a seemingly cogent and cohesive sense of self. In the second, ‘Uproars’, Kipnis looks at the social response – the loud condemnation of the perpetrator – and the role such scandalous narratives serve given their popularity, as evinced by their recurrence. Real scandals, which have “pathos and tragedy”, are distinguished from other crimes and misdemeanors by the fact that they take place in the public eye. What would otherwise be physical or sexual assault, lying, manipulation and exploitation become “free public theater” in which the audience is invited to both judge the perpetrator and revel in their own superiority. This social response is where Kipnis believes scandal has its importance – as a “social purification ritual” which reinforces cultural norms and morals. Surprisingly, however, Kipnis fails to address the issue of the other individual involved in the narrative of scandal – the victim.